We’ve also decided to add information on some of the locations we’ve been to around the world. 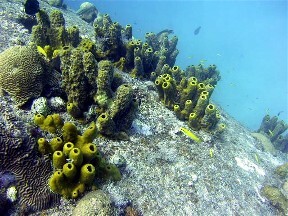 Not really well known for diving, Aruba actually has some pretty good diving. 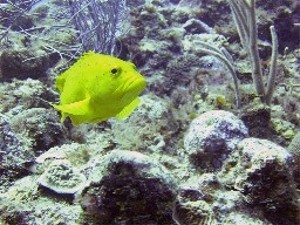 This was more of a beach relaxation trip for us, but we did end up diving a couple of days while in Aruba. 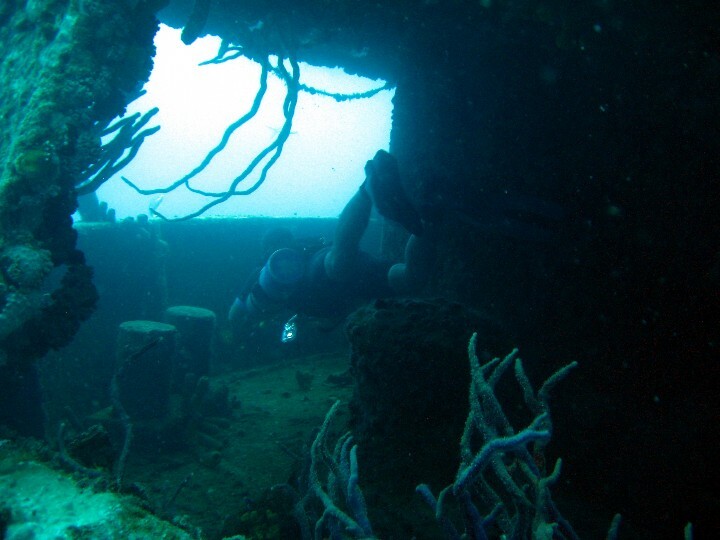 We opted for the wreck diving days and were able to dive on 4 wrecks, 1 German U-boat supply ship that scuttled by the captain rather than surrendering the ship to Dutch Marines. 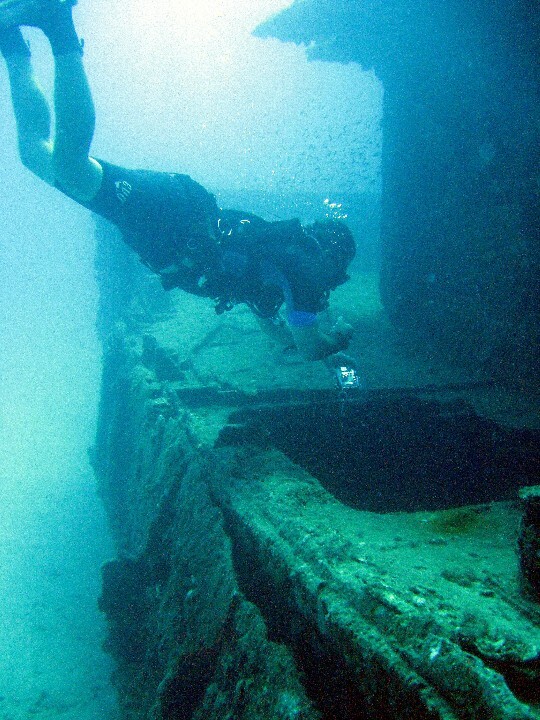 The other 3 wrecks were sunk as artificial reefs to improve diving around the coast of Aruba. We would have liked to have done a little more diving but the only other wreck diving day was the day before we flew back. 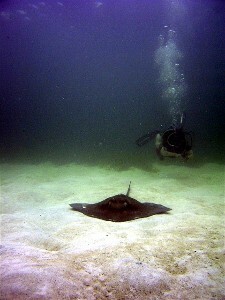 This was our first non-cave diving trip in several years. Before leaving we put together a couple of rigs so we could sidemount a single cylinder rather than strap it on our backs. 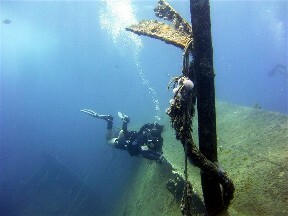 We also made sure we chose a dive operator that would allow us to dive a little different than most divers. 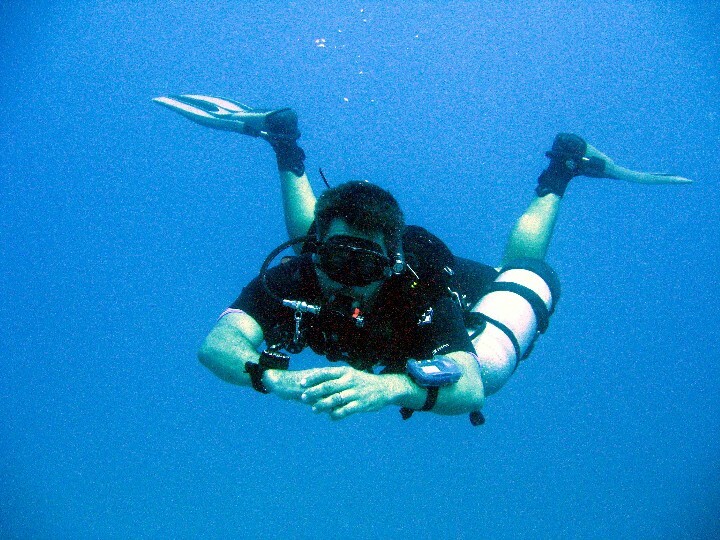 It was much more comfortable and more to our liking to dive this way. 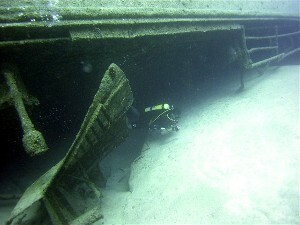 Our first dive was on the Debbie II wreck. 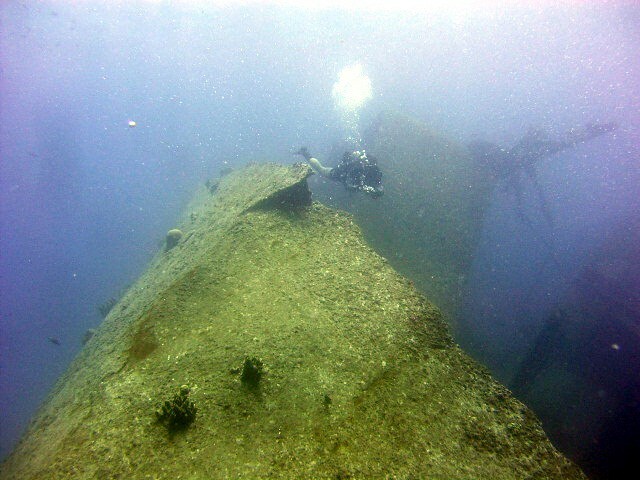 This is a wreck that sits in about 60′ of water and was sunk as an artificial reef several years ago. 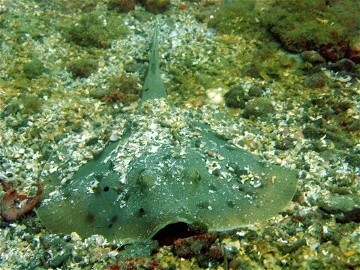 There are several cut outs on the wreck that allow for minimal penetration. There was a lot of life on the Debbie II. 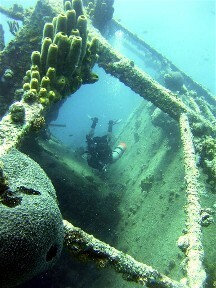 We then headed to the Antilla wreck, the only wreck along the island that was not sunk as an artificial reef. This is the German U-boat supply ship. The captain got his crew off the ship then fired up the boilers. Once they were heated up, he flooded them. The extreme contrast in temperature between the boilers and the sea water cause the boilers to explode and break the ship in half. 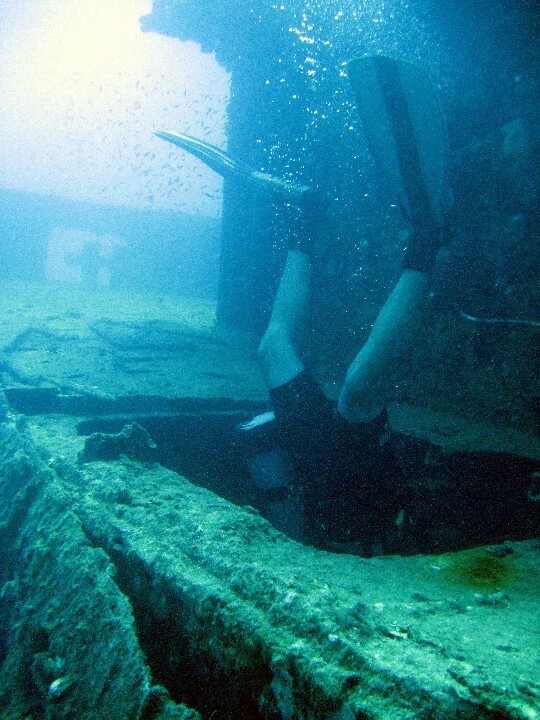 The 400′ long ship went down in 55′ of water. 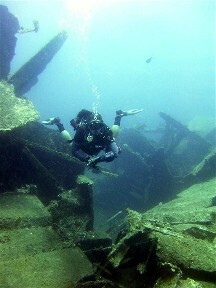 Up until a few years ago parts of the wreck could be seen above the surface of the water. 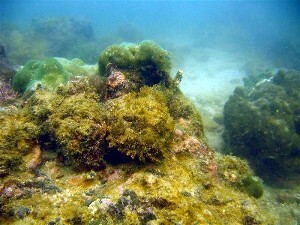 It has deteriorated enough that the shallowest section sits about 15′ below the surface. There are some areas that still allow simple penetration and there is a lot to see at this site. 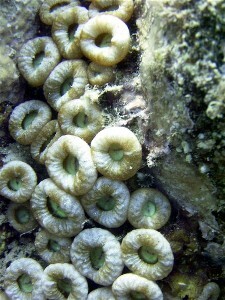 There is lots of mature life on and around this wreck, and lots of macro stuff if you take the time to look. 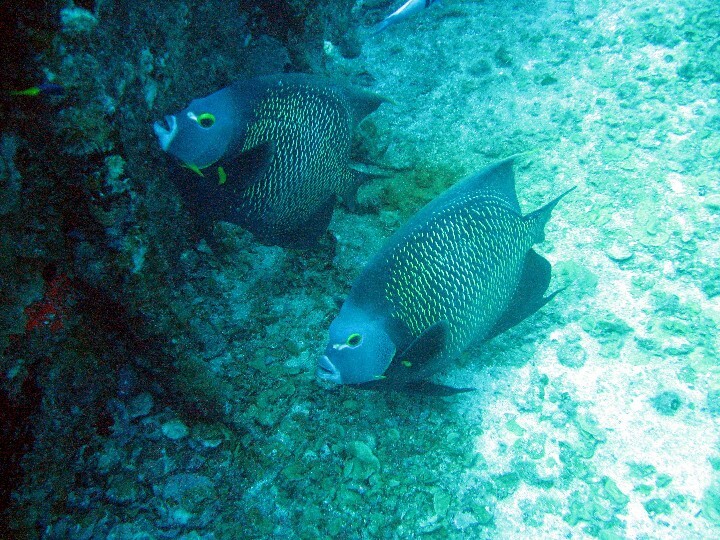 The second day we headed out to the Jane Sea. 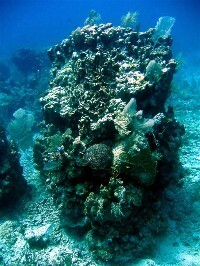 This is another artificial reef. 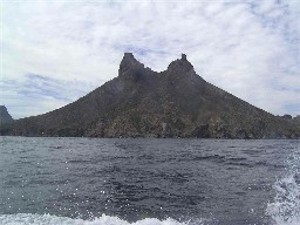 The Jane Sea was seized by the government several years ago after it was caught smuggling drugs. The government held onto it waiting for the owner to come claim it, which he never did. 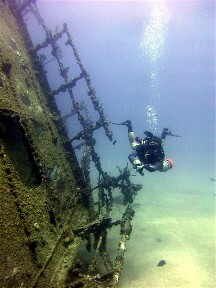 The dive community on the island got the Aruba government to donate the wreck to be used as an artificial reef. 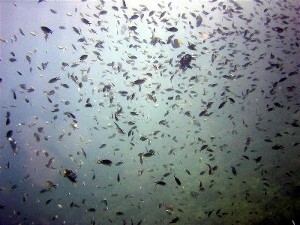 There is also lots of life on this wreck. 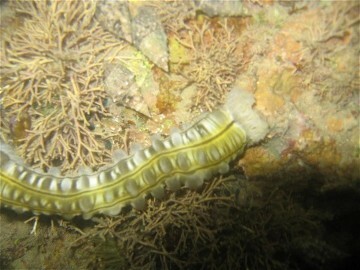 This final photo wasn’t taken during a dive. 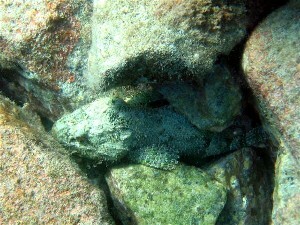 It was taken in 4′ of water at Baby Beach during a snorkel. 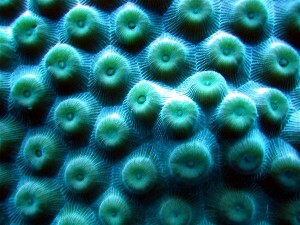 The vast size of this brain coral is just amazing! Overall, we experienced some great conditions. 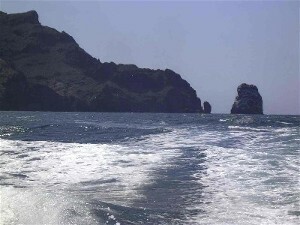 Seas were flat on the east end of the island and only about 3′ on the south side. Visibility was about 40-50′. Water temperature was 83 degrees. We had a great time and definitely recommend when traveling to Aruba to get at least a day or two of diving in during your stay. Overall, a great destination. We departed dock from Miami, FL and spent the next 7 hours cruising across the Gulf Stream towards Bimini. Yes, we did this on a liveaboard. This was a 104 ft sailboat with 10 divers and 5 crew members. What a week! 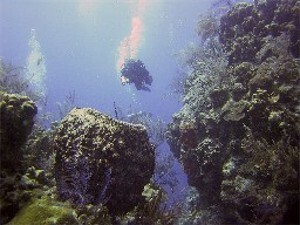 Usually we don’t advertise where we stay or who we dive with, but the Juliet definitely deserves mention. Capt. John runs a top notch operation. He caters to each group. 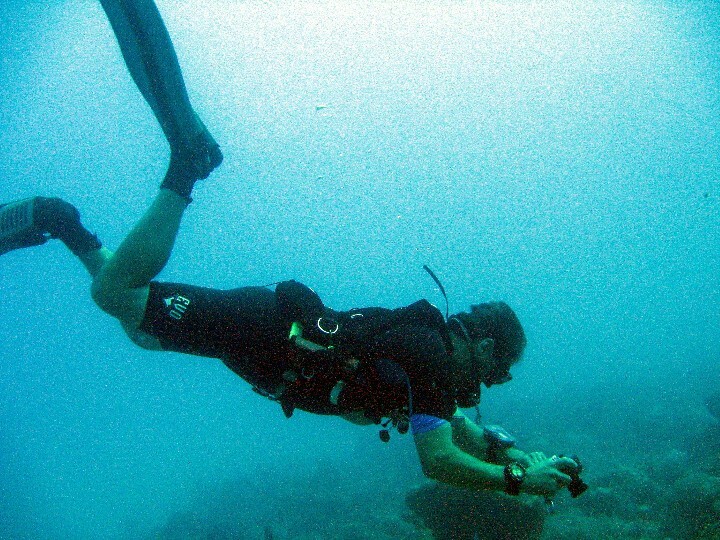 He goes where the dive group wants to go (taking weather forecasts into consideration, of course). 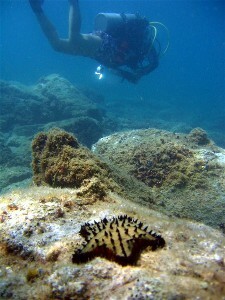 He provides divers with a great diving vacation. 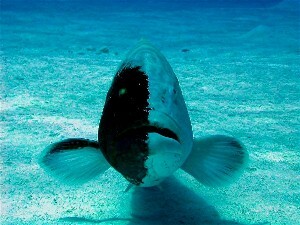 We saw tons of sea life, including the half black, half white grouper below. 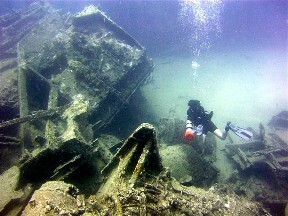 We dove lots of wrecks. 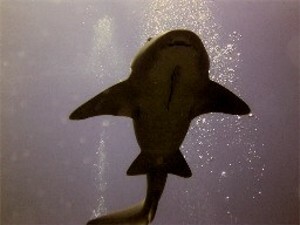 We even did a couple of shark dives. 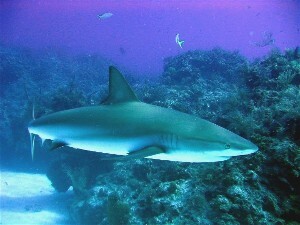 Capt John doesn’t feed the sharks, but he knows where to find them! 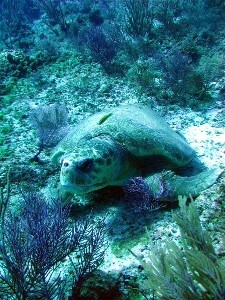 We also got to see a sea turtle during our last dive. Oh, and we even got to spend a little time on land. We stopped off in Nassau for a few hours one night to pick up some souvenirs and have dinner. This was our choice. If we didn’t want a land stop, we didn’t have to do one (although Capt. John does need to stop in quick to say hello to customs). We also stopped off on an uninhabited island for about an hour to gather shells and off gas for a bit. All in all, it was a fabulous trip. 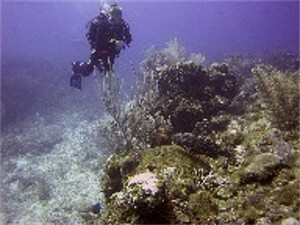 We did a lot of diving and a lot of relaxing in between. We also got to learn some basics about sailing and even got to help with hoisting the sails! Although this isn’t a requirement. The crew will handle it all. We just wanted to help out and learn. We also met some great people on this trip. This is definitely a liveaboard we’ll dive with again in the future. Weather and group choice make each trip different. 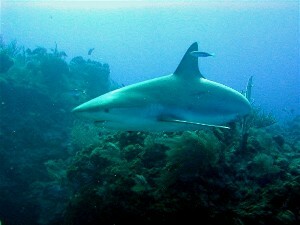 You could sail the Bahamas on the Juliet several times without seeing the same dive site twice. Capt. 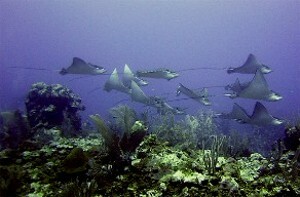 John also sails Turks & Caicos during the winter months. 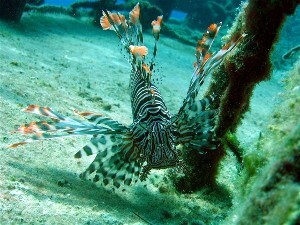 One sad thing we saw was a Lionfish. 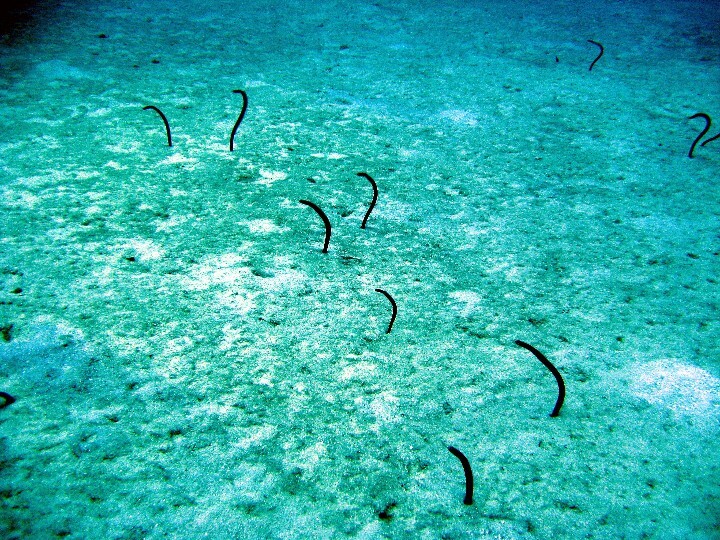 These are not indigenous to the Bahamas. 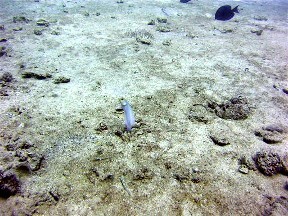 This was most likely an aquarium fish that was no longer wanted and dumped into the sea. 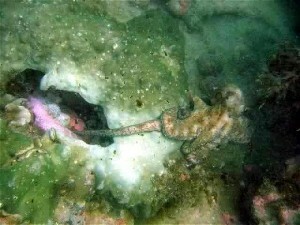 It’s found a home here on this wreck, but it should be where it belongs in the South Pacific. Overall, a good destination. We flew to Ambergris Caye and stayed there for a week. 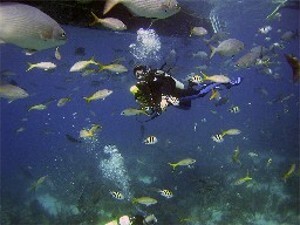 If you’re looking for a laid back, combination dive/relaxation trip, this is it. We dove every morning at 8am, with about an hour surface interval at the resort, then done by 1pm. There are a lot of decent sites within minutes of the docks. 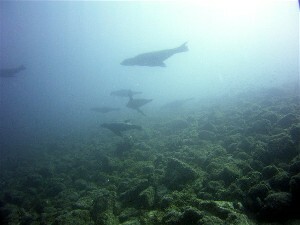 Viz was about 80 feet just outside the reef. Swells were also 4-6 feet most of the week. 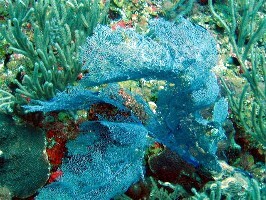 Lots of marine life to see. 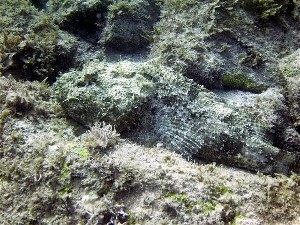 Grouper were abundant. 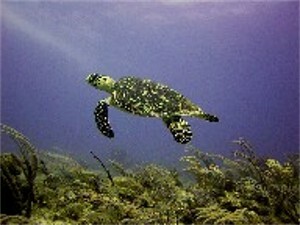 We even saw a few sea turtles! 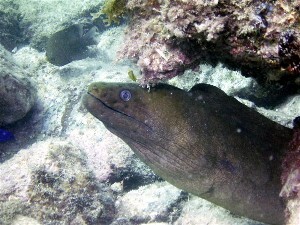 We also saw a few Moray eels. 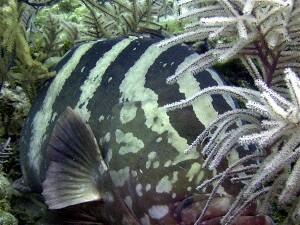 The most aggressive one is this one, which was fighting with the nurse sharks for the chum. 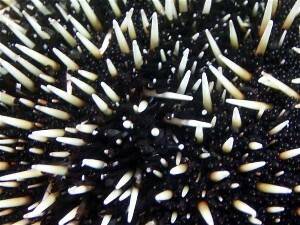 You can see how far he came out of his hole to eat before the sharks got the chum! 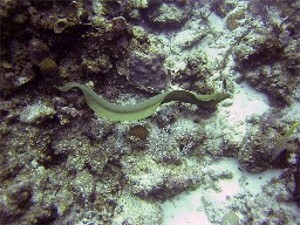 We also saw one swimming along the reef at the outer atolls, but he was too quick for us to get a photo. 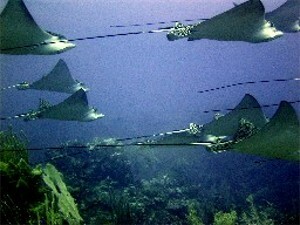 The amazing part was how they kept in perfect formation while gliding along. Ya think birds learned this formation from them or is it just coincidence? 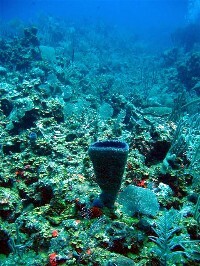 Lots of coral and sponge to see. 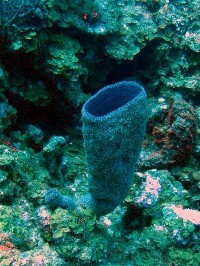 The best diving was at Half Moon Caye and Lighthouse Reef, though. Viz was easily 100+ at the outer atolls. 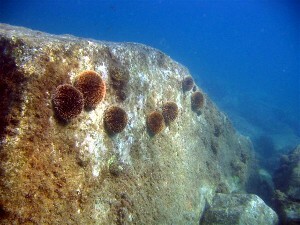 The reefs were also in much better shape. The problem is it takes about 3 hours to get there from Ambergris. After dive activities were limited to checking out the small town of San Pedro. The roads are dirt. The vehicles are golf carts. There are some small cars and trucks there, but not many. The island offers some very good restaurants to eat at. They also have several souvenir shops. We even saw a few Internet cafes. If you’re looking for excitement on land, though, this isn’t the place to go. Time seems to stop on Ambergris. We had a nice, enjoyable, relaxing vacation, and we’d go back for the same thing. 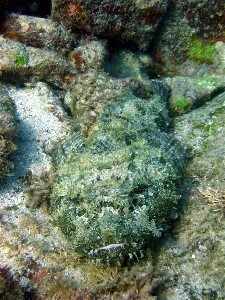 However, the better diving can really only be accessed by liveaboard, of which there are several in the area. If you’re up for the travel and extra expense, you can also take a day or two and head to the mainland to check out the Mayan ruins. By the time we had our free day (the day after our Blue Hole trip), we weren’t up to another long commute. Besides, you really need more than a few hours to truly appreciate the ruins. 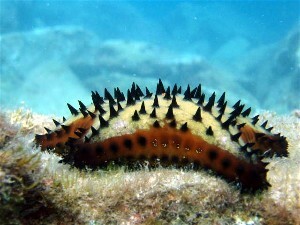 Your best bet is to schedule a few days just to spend on the mainland, either in between or after your dive days. 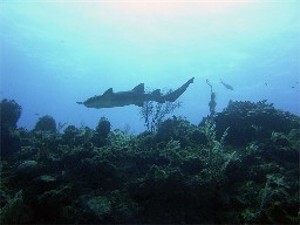 The next time we head for Belize, it will be on a liveaboard. 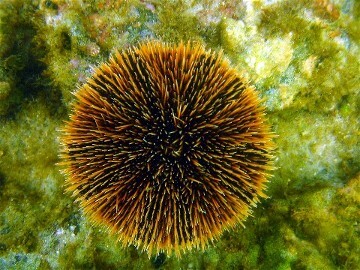 But if we ever want a true vacation (one on which you actually get to rest and relax), we’ll head back to Ambergris. 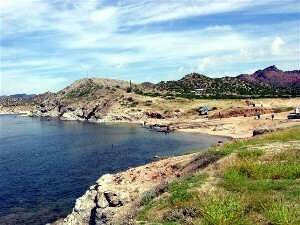 Located about 1 hour west of Hermosillo, Kino Bay is mainly a fishing village. 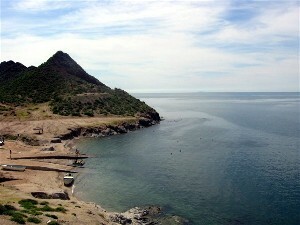 Along what is called Kino Nuevo is a long, narrow, sandy beach about 10 km/6 miles long. There is definitely nothing worth diving in this area. 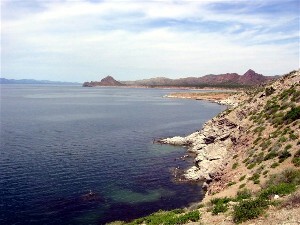 However, if you keep heading north on Mar de Cortez, the road along the beach, you will come to a dirt road. Keep going on that dirt road until you see the boat storage facility. Head left there to the boat ramps. 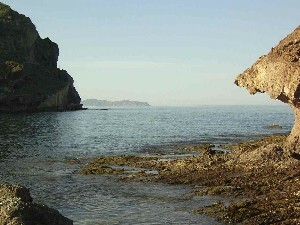 This area of Kino slopes down off the air exposed hills and cliffs into the water. There were a couple of armed guards at this location (not sure why). 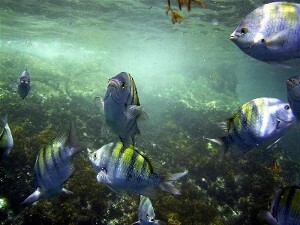 We asked them about swimming and diving in the bay and they had no problem with it. They stated they have seen it done here. 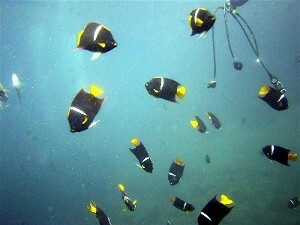 We searched for a dive shop in Kino Bay without luck. There are advertisements for one; however, after exploring their website we discovered that they can arrange for local dive guides, but they don’t actually have a physical presence in the town. So bring your own air. You won’t be getting any in Kino Bay. 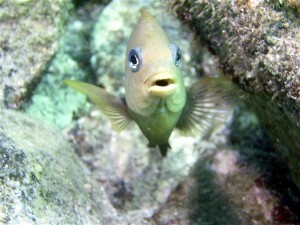 We haven’t gone diving with the local guides yet, but do plan on checking it out soon. 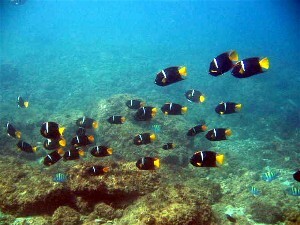 Kino Bay is surrounded by several islands which look very promising for scuba diving. We’ll be scheduling a trip back to Mexico, with a day in Kino, as soon as we can. Located about 1/2 hour from San Carlos, Mx. 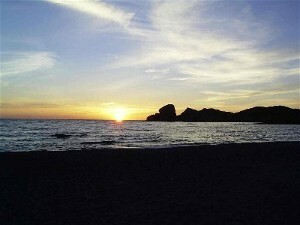 This is a public beach in Mexico. It’s about five hours from the Nogales border crossing south of Hermosillo. It is about 15 miles off the paved road and does require a high clearance vehicle. Four wheel drive isn’t necessary, but it is helpful. There are no facilities on this beach, so unless you go with one of the dive shops that does trips down there, you’ll have to bring your own water, food, tanks, and so on. The diving here is pretty good, though. Visibility averages around 20 to 30 feet. There are two bays to choose from. 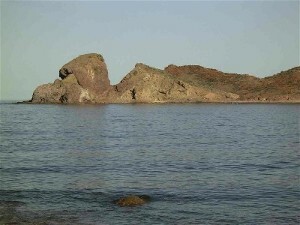 You can swim around Mushroom Rock from one bay to the other without a problem. If you bring down an inflatable boat, you can also take it out to a variety of sites within 20-30 minutes away. 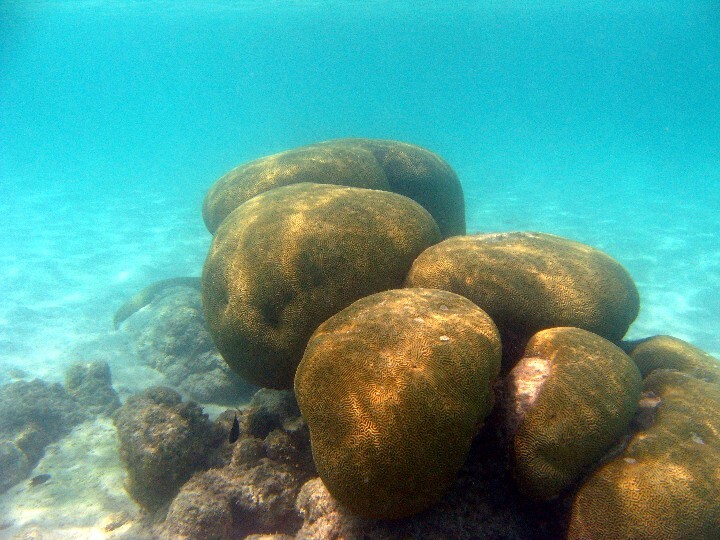 At the end of Mushroom Rock you’ll find Stingray alley. 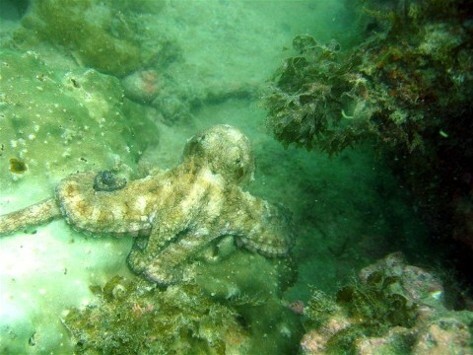 If you swim over the rocks and coral to cross over to the other bay, look for the ledge where the octopi hang out. Keep an eye out for the pile of empty shells. 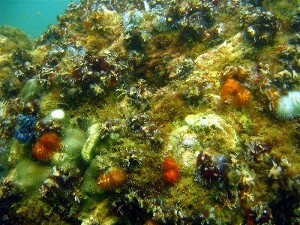 There is a lot of marine life to be seen in this bay. 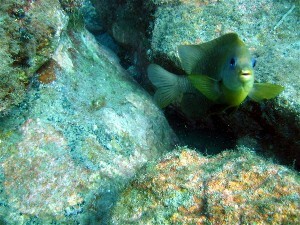 If you have a small boat, you can also go out to some of the areas just outside of the bays and do some deeper dives. 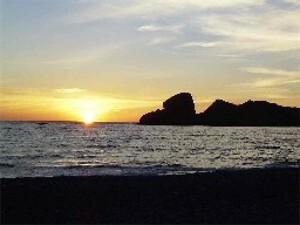 Once you’re through diving for the day, kick back in front of your tent and watch the beautiful sunset! 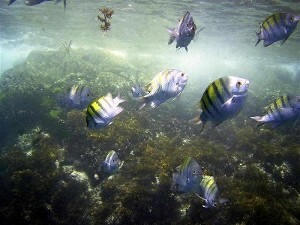 We’ve been to the Puerto Aventuras area a couple of times already. 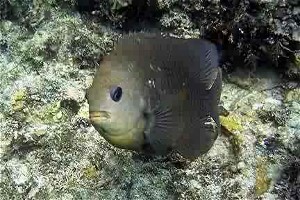 We have yet to do any reef dives there, but during our last trip we had some diving family members that spent a day doing a couple of dives off shore. 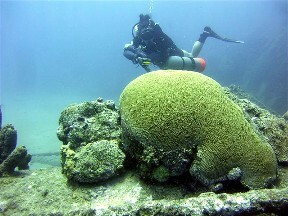 Both a deeper reef dive (80′) and a shallower reef dive (40′) were done and there was an agreement that the shallow reef was the better of the two providing more life for divers to enjoy. 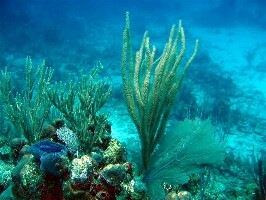 The reefs are only a few minutes off shore, which makes for a quick boat ride from most marinas. 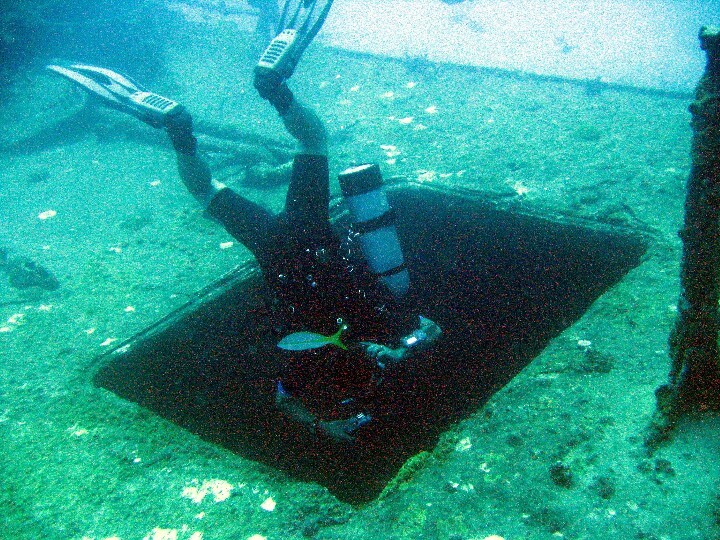 Most shops head back to shore in between dives for the surface interval. 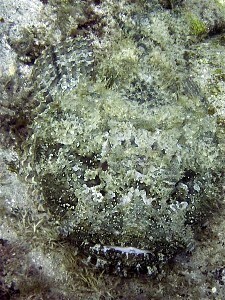 Even with this break, a two dive day usually ends around 1pm. 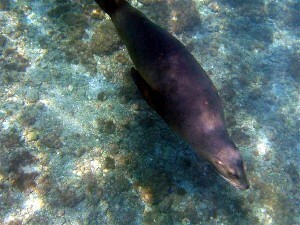 We have plans to continue to return to the Puerto Aventuras many more times. 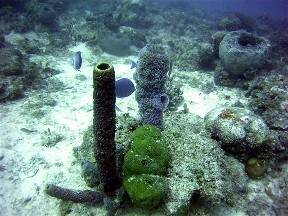 We’ll probably head off shore sometime soon to check out these beautiful reefs ourselves. Located about 1 hour south of the Arizona/Mexico border through the Lukeville, AZ border crossing. 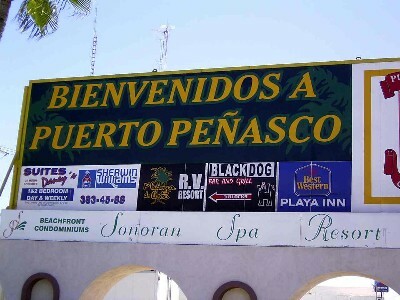 This is a very Americanized tourist town at the north end of the Sea of Cortez in Mexico. 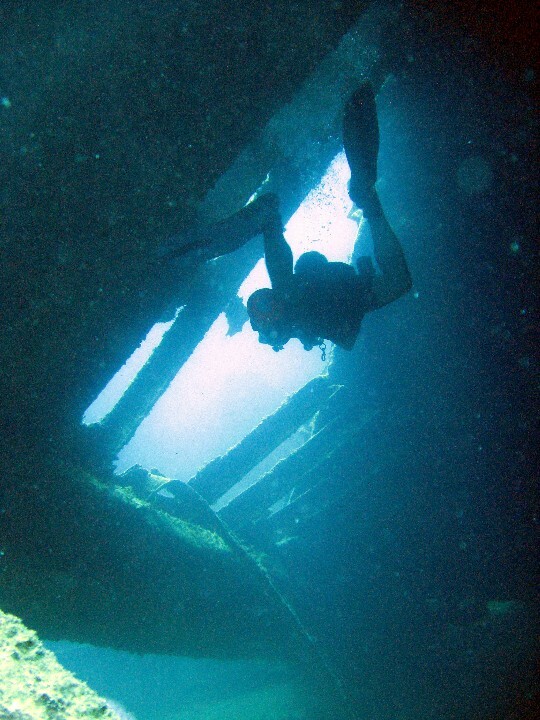 We haven’t actually been diving there, but we made a trip down to check it out. We stopped in at one of the dive shops (maybe the only one) to ask about local diving. We didn’t get a great response. We were told the seas were too rough, as is the usual case in July and August. Even the boats weren’t going out. We’ve also heard that in general the diving there isn’t all that great. We took one of the “not to scale” maps and drove around anyway. We didn’t find much in the way of good shore access. In the main part of town there’s a bay near the marina where locals enter through boat ramps to swim, but the only parking is on the street with no safe place to get geared up. We also drove east through some American neighborhoods towards some bays/coves shown on the map, but we couldn’t find them. 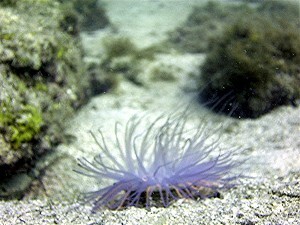 Probably the best place to gain access to the water is at Cholla Bay. This is another predominantly American neighborhood to the west. Even though the tide was almost completely in when we got there, the water level of the bay seemed to be low. At the tip of the Cholla Bay area is a site called Pelican Point, but this area is totally exposed to the sea and the winds and currents. All in all, Puerto Penasco is a good place to lay out on the beach during the day and hit the clubs at night (they even do foam parties), but most of it is just straight beach with nothing to see underwater. 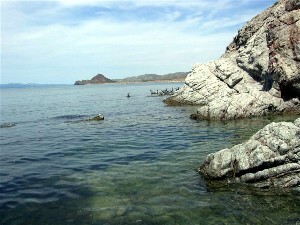 San Carlos is about a five hour drive past the Nogales border and well worth the trip! The town is well established. There are several restaurants, hotels, and night clubs. It even has three dive shops! There’s not much shore diving here. 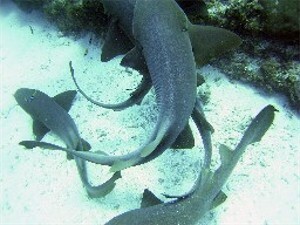 You can dive Lalo and Frenchie Bays. They’re right next to each other on the road that leads out to the beach resorts. Just follow the main road to the right when you get to the Y. It will wind you through a small residential area. Right after that will be the short dirt road that leads to the coves, 4×4 not required. 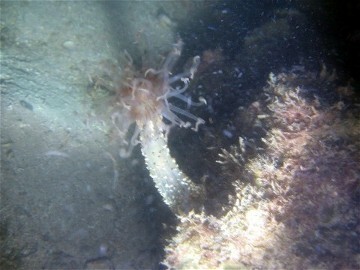 The coves reach about 35-40 feet deep depending on the tide. 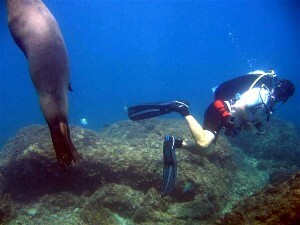 For the best diving in San Carlos, you’ll need to sign up with one of the dive shops down there. All of them have boats going out daily. Make sure to call or e-mail and make an appointment, though, if you want to dive during the week because there’s a minimum for the boat to go out. 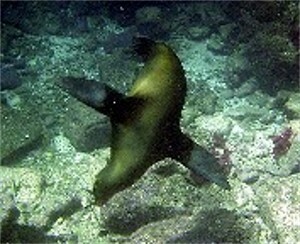 Try to book a boat going out to San Pedro Island, also known as Seal Island. Visibility can be greater than 100 feet! You can reach recreational depths and more. 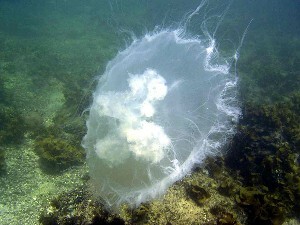 Marine life there is abundant. If you’re lucky, the seals will come play with you. A word of caution–let the seals approach you. They won’t hurt you then, but if you try to approach one and it happens to be a mother that has a young one close by, you could get bitten! 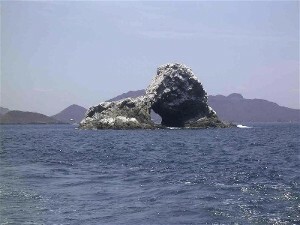 There are closer sites by boat as well that are just as good as the island. So don’t write off San Carlos if you don’t get a chance to go to the island. 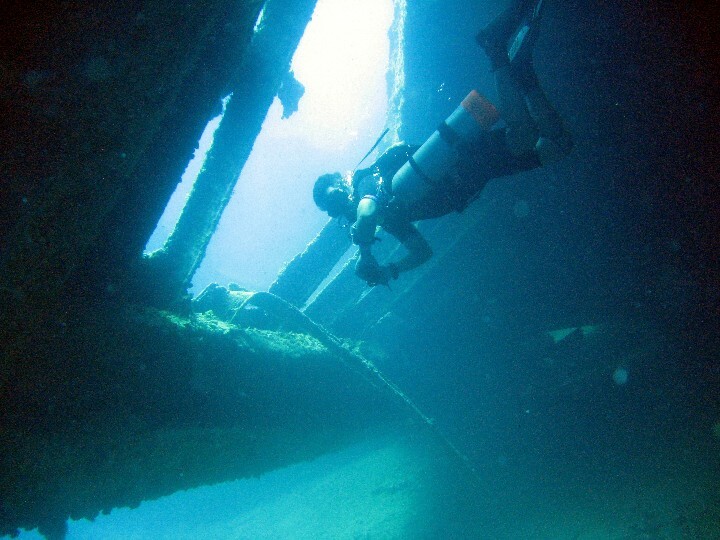 There’s an old ferry that sank not too far as well if you’re interested in a wreck dive.